I’ve gotten a number of emails from composers and sound designers asking about how to get into game audio, so I wrote up this guide to explain what I’ve done to make my career work so far. Hopefully it will give you some insight. Keep in mind that this is what worked for me, and your path might be different. Also, I’m no industry veteran; prior to June 2015, I had never met a game developer in my life. In the summer of 2015, I myself was searching for a guide like this, when I stumbled on this entry on FTL composer Ben Prunty’s blog, which gave me some good ideas on how to start. As such, I think my guide is best intended for people who are wondering what the first few years of a freelance career could potentially look like, and would like to know where to start. Another great resource (which I didn't have when I started) is Akash Thakkar's website and Youtube channel. He has a lot of free content to offer on the subject of getting into the game industry, plus some paid content if you choose to check it out. He's got a lot of good things to say to people starting out. This guide assumes you already know how to competently make sound in your DAW; I'll only be discussing the business side of things. And please let me know if any of the links below are dead! Attend local events where game developers are hanging out and showing off games! You don't need a portfolio of game audio work to start attending these events and becoming part of your local game developer community. Just go. Play games, make friends. Don't psyche yourself out into not going just because you don't have a reel yet. You don't have to pretend to be a working professional with multiple shipped games. You can just be who you are - someone who is interested in the community and wants to meet people. There will always be time to show your portfolio later, if you don't have one to start. There will be developers at these events who are just as nervous as you - maybe they're making their first game, or maybe they're showing off a game to the public for the first time. 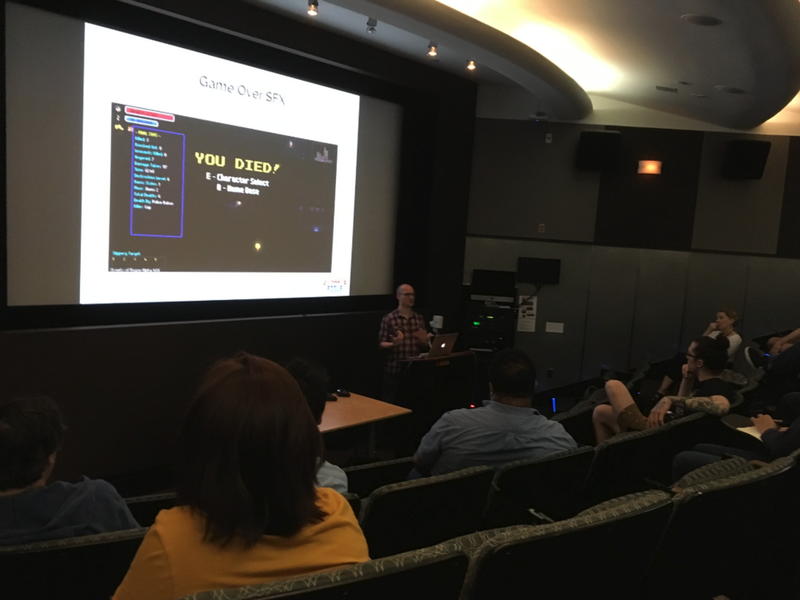 Where do you find out about local gamedev events? At a lot of these events, developers are showing off games they're working on, which means that you don't have to talk to people the entire time; you can walk around, play games and chill out too. At the first local event I attended in June 2015, I didn't know a single soul there and was incredibly nervous. It seems laughable now since a lot of the people I met at that event are now my friends and clients. I can think of at least five developers I work with who were showcasing their games at that first event I attended, and I personally met at least three of them that day. However, I wouldn’t start working with most of these devs until a year or more later, after I had met them many more times. This illustrates the point that a lot of gigs can take a while to blossom. You shouldn't feel discouraged if you walk away from your first event without a gig in hand - in fact, that's what's likely to happen. That's why you need to attend these events regularly. Plus, the more often you attend, the more fun they will be, because the more friends you will have at the next one. "Networking" isn't about throwing your business card at every developer you see, but it's about being nice, engaging in conversation, and taking interest in other people. You could even volunteer to help out one of these gamedev organizations. My friend Mark Benis is a young composer who got his first gig working on a game called Lamplight City by volunteering at events put on by Playcrafting, an NYC-based organization. Volunteering gives you something to do at the event (instead of just standing around), gives you an easy introduction to the event organizer and other volunteers, and people appreciate it. 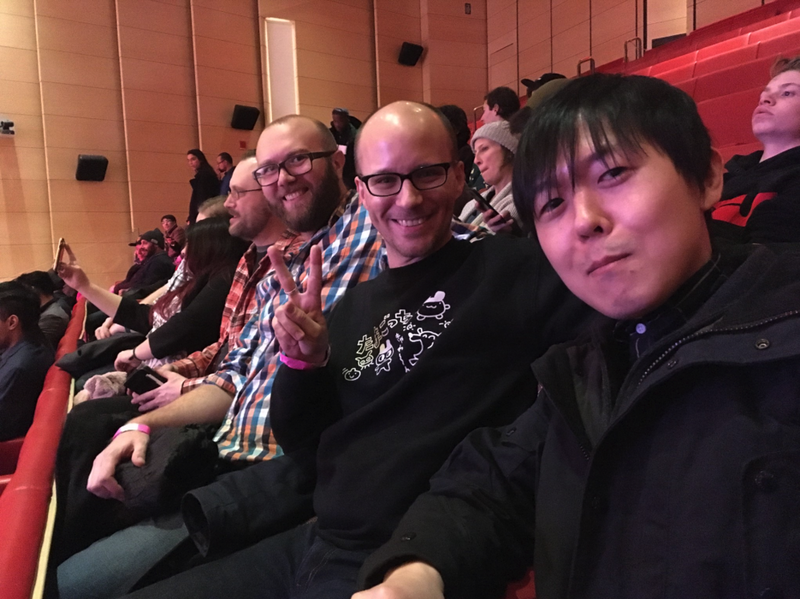 Me with the developers of Treasure Adventure World and Neon Krieger Yamato, hanging out at a Playcrafting event. Rescore some footage from a pre-existing game. Attend a local game event, play some games, imagine what the music for that game would sound like and write it. This can just be an exercise if you like, or you can send it to the developer as an unsolicited pitch! Do a game jam (more on that later). Or just write some tracks in different genres that you think sound "video-gamey". This is what I did before attending my first event (although, because I wrote the music totally out of a context, it didn't sound very good as usable video game music). I think a playlist of four to ten tracks in different genres, each about 1 minute length, is a good start to a game music portfolio. But don't overthink it. If you only have three tracks, start attending those events anyway and make some friends. Make sure to clearly indicate that it is a "redesign" and not the original audio from the game. It's a very bad look if it seems like you're trying to suggest you worked on something that you didn't. The screen capture quality of the footage needs to be good. If you can't find good footage on Youtube, you could always play the game yourself on silent and record it using a free program such as OBS. It’s dangerous to rescore well-known games with iconic themes. People already know what a Final Fantasy game sounds like; they’ll only be underwhelmed when your music or sound design doesn’t top what they already know and love from the original source. There are a number of projects you can download online and rescore - a big one is the Limbo Wwise project, which can be found on this page here. The Limbo project and other similar projects are a great exercise, but just keep in mind that many other students of game audio have redesigned these projects, and if you put them in your portfolio, it may not stand out. By the way, I think a lot of the music I wrote during this phase of my career is terrible, and I feel totally ok about that. You have to start somewhere! A version of my game music playlist from late 2015. All of these tracks were either game jam themes, pitches I wrote for games I didn't get hired on (and subsequently retitled), or tracks I wrote to beef up my portfolio. My first portfolio reel was composed entirely of footage from game jam games I scored. Some of these game jam games I worked on even got some press coverage. A number of notable games have started as game jam games, then continued to be fleshed out as full experiences and released after the jam. 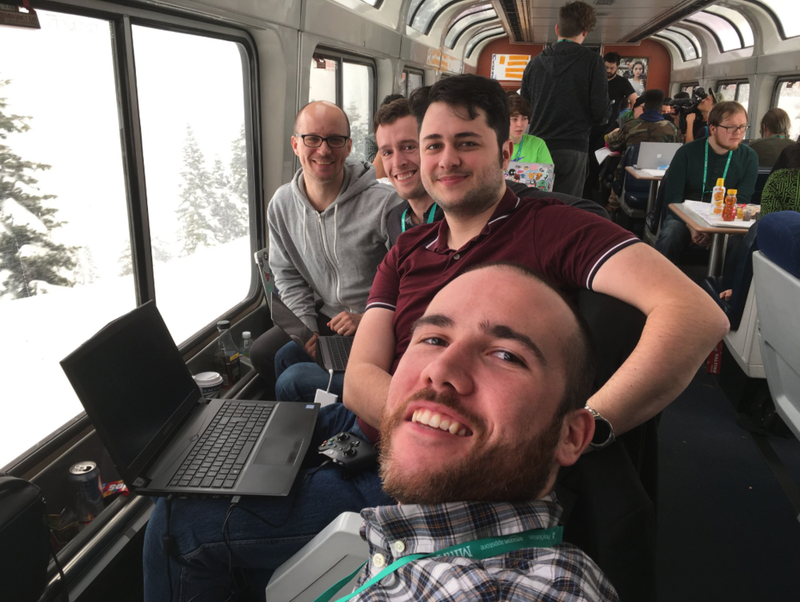 Me with my Train Jam team. Eventually, you want to have an attractive website (not just a Soundcloud page) showing off footage and audio from your rescored footage, game jam games, and games you’ve worked on. I think it's ok for your film / commercial / band music to coexist alongside your video game music at first, but eventually you might want to think about creating separate websites for these things. A game audio company called Powerup Audio has a weekly Twitch stream called Reel Talk where they evaluate game audio websites and reels. Kevin leads the stream. His advice is spot-on, and he also doesn't butter you up; he'll realistically tell you what's working and what isn't. Watch some episodes to get a sense of what a good website looks like. Once you’ve built a site you’re happy with, submit it to Reel Talk yourself. Have it be torn apart, then take what you learned and build a better site. If you’re both a composer and sound designer, eventually you'll want to consider making separate reels for sound design reel and music, to let each shine on its own. I've been writing and recording music since my teens, but I hadn’t done any sound design prior to starting in the game industry, and now, for half of the projects I work on, I'm being hired to just do the sound design. So it's important for me to have separate reels. That being said, when I was hired to work on Streets of Rogue, my sound design and music reel were one reel, my reel consisted mostly of game jam games and one or two mobile games, and my video game music coexisted on my website with my band's music and my film and commercial reels. So keep in mind that you can still get gigs even if you haven't integrated these suggestions into your site yet. Kevin from Powerup Audio giving me feedback on my website circa early 2017, back when my game audio work and band production work still coexisted on one page. You can still watch my episode of Reel Talk if you want! It's not for everyone, but in general I think it's a good idea to keep a Twitter account. I tweet occasionally, but I mostly use it to keep in touch with people I've met at events, see what people are talking about, and hear of the occasional job opportunity. It's also a good way to find an online community if you don't have one locally. A good place to start is to check out the hashtag #screenshotsaturday. Developers use this hashtag every Saturday to show off images or videos of games they're working on. Follow the people who are showing cool things, then see who they're talking to. At the bottom of this guide, under the "Where Do I Get Gigs?" section, you can see that a few of my gigs wouldn't have happened at all if I wasn't on Twitter. I use Facebook as well, but I'm not sure if there are any gigs I can say that I got "because of" Facebook. P.S. If you're looking for an LGBTQ community of game developers, my friend Josie Brechner is a great person to follow or DM for questions. If you haven’t done so already, you should start teaching yourself how to use audio middleware such as FMOD or Wwise (it's pronounced "wise"). I'm not going to go into too much detail about what audio middleware is, but to quickly summarize, it's a kind of tool that an audio designer can use to have more personal control over the audio that goes into a game, create a better mix, and be more adventurous about how audio can respond to what's happening on-screen. FMOD has a Youtube channel with a number of tutorials. Wwise has a certification course you can watch for free (if you want the certification itself, you have to pay for it). Both FMOD and Wwise have sample projects you can interact with. Kevin from Powerup Audio has an absolutely terrific 4-hour video where he breaks down the FMOD session for a game called Celeste. I actually shipped a number of games before learning to use middleware (including Streets of Rogue), but you'll want to eventually learn it so you can create better audio experiences. You also might want to eventually teach yourself the basics of game programming and navigating game engines. I've done courses on Unity and Unreal through a website called Udemy. I use this knowledge to directly implement audio code into games I'm working on. Something I haven't done myself, but which I've seen some other audio people do, is to actually make your own little game and use that to demonstrate your audio. Early on, if you're meeting a lot of developers who don't have the budget to pay you what you're worth, you could always do a skill swap. See if they'll offer you some lessons in the game engine they're using, in exchange for you designing some music or sound effects! Some of my colleagues also suggested you could ask them to finance the purchase of a new sample library (which you'll be using in the game), ask for a connection to someone else in the industry, ask them to design your website if they're a web developer, and so on. You'll also want to learn how to use version control tools like Github so that you can start pushing audio assets and code by yourself to a shared project you have with a developer. It's not as hard as you think. Once you've learned how to use middleware, you can now make a separate reel showing off your audio implementation work, like I've done on my website. Sound Design channels on Youtube. Listen to the Beards, Cats and Indie Game Audio podcast. Here's a good episode for beginners. There are tons of GDC talks available for free on Youtube, both about audio and about game development in general. Designing Music Now has some good articles. I like this series on Cultivating a Career by Penka Kouneva. Consider applying for the Audio Mentoring Project. They're a fantastic organization. I've been a mentee and have learned a ton from it. A Sound Effect keeps a calendar of audio-related events around the world, if you're interested in attending a seminar in person. Many people go to university to study audio, but personally, I was an East Asian Studies major, so don't feel that you're hindered if you don't have an audio-related degree. You could even eventually consider making some of this content yourself! My friend Alex Barnhart was making sound design videos for a while that averaged a few hundred views per video, then suddenly one of his videos blew up on Twitter, and now he has a job working for a celebrated audio studio. As for myself, recently I've started giving talks on the work I've done on Streets of Rogue. Me giving a talk to the local NYC Game Audio group. There are certainly people who have careers in the game industry who don't attend conferences, but I consider it important for me to do so as a freelancer, and I've gotten a number of gigs and connections from attending these events. Other North American conferences include the Montreal International Game Summit, Indiecade, Fantastic Arcade, and more. There are a number of conferences and festivals in Europe that I haven't been to, including Gamescom, EGX and so on. I met Matt, the developer of Streets of Rogue, at Indiecade in LA in 2015. At the time I had a respectable-looking website, had done a bunch of game jams and met a lot of people, but I hadn't yet gotten a paid gig. He hired me a few months later; by that time I had beefed up my portfolio with at least a small handful of shipped mobile games (but I still kept a bunch of game jam game footage on my site for a while). From this experience, you can see that it's perfectly fine to attend events even if you don't yet have much of a track record, because you're planting seeds for the future. And just because you haven't yet done a lot of the things I've mentioned on this guide, doesn't mean you won't get hired - I got hired by Matt before I did many of these things. I recognize that it's a privilege to be able to afford to go these conferences, and to be close enough to attend them - for instance, recently it's been harder as a foreigner to get into the U.S. to attend GDC, and a number of game developers have had their visas rejected and could no longer go at all. If you qualify for their assistance, there are organizations like I Need Diverse Games and GANG Scholars who occasionally sponsor passes to events like GDC or Gamesoundcon (which is less a networking event and more of an education-focused event for people working in game audio). You can also volunteer at many of these conferences in order to get a free pass. The volunteer program at GDC is actually a bit competitive to get into (I've applied before and haven't got in), but I'm told that you meet a lot of very talented volunteers if you do get to do it. Still, if you can't attend the big conferences, then focus on attending as many local or nearby events as you can, as well as becoming part of an online community and searching for opportunities there. Down below, I'll give specific examples of the many different places I've gotten gigs from, to give you different ideas of where to look. Don’t worry if your game audio career requires more time to take off than you initially expected; it can take a while to build up a big enough network to have a steady supply of gigs. If you haven't been making music or sound design for very long, it'll take even longer to build a career, as you'll probably need more time to educate yourself, get good, and grow in your abilities alongside some of the game developer friends you'll be making on the way. Don't worry about your age. I was 31 years old when I attended my first local gamedev event. There are also people hanging out at these events who are still in school. If you’ve been attending events regularly, meeting a lot of people, making friends online, and pushing your abilities as you work on new projects, things will start paying off in the form of referrals, word of mouth, and your growing reputation. Only a small percentage of conversations that you have will turn into actual gigs. Don’t worry about walking out of every event with a new gig. Go to make friends and have good conversations. Then make friends with their friends. And so on and so forth. Do make sure that people know what it is you do and what you work on ("I'm a freelance sound designer and composer for games"), but it's probably better to not be too pushy about it. I think Akash Thakkar has a lot more to say about effective networking, and you should check out his videos for more on this topic. For what it's worth, I've written demos for a lot of games I didn't get hired on, including a number of games that have gone on to be very successful. So it goes. Don’t dwell too much on missed opportunities. If another composer that you know gets a gig you wanted, celebrate their success! There are plenty of opportunities out there, and more will come along. It's also important to maintain a mutually supportive network of other composers and sound designers. Make sure to keep a spreadsheet of the people you meet, and take notes so that you can remember things about them the next time you meet them! Just look at this pile of business cards I've collected. A stack of business cards I collected after about 2 years of networking. You can see how many people you'll be meeting. Check out this Quora page to start getting ideas on this, and hang around the Business Skills for Composers Facebook group for discussions about this. Where Do I Get Gigs? Here’s a smattering of where some of my gigs have come from, to give you an idea of all the things you could be doing to put yourself out there. Streets of Rogue: I met the developer at a festival called Indiecade in LA in 2015, and made sure to keep in touch with him online afterwards, both on Twitter and by following his devlog on TIGSource. If you look at his devlog, you can see me commenting on it! Party Hard and Party Hard Tycoon: Once Streets of Rogue signed to our publisher Tinybuild, I helped out at their booth at multiple PAXes and became friends with them. Party Hard is another game they publish. Silicon Zeroes: I responded to an open call for a composer on TIGSource. A Hat in Time: I responded to an open call on their Twitter page for dialogue implementation in the game. I only saw this because I follow other game audio people on Twitter, and someone must have retweeted the developer's tweet. I don't remember who did, but thank you! Nano Golf: I responded to an open call on the Reddit Gamedev Classifieds board. I worked with this developer on two unfinished games together and one game jam game before we finally made Nano Golf (luckily those unfinished games didn't get too far along, so I didn't feel a huge loss at the unused music). Overall, I don't often get gigs from Reddit or TIGSource, because the quality of the work posted there is all over the board, and anytime there's an open call for audio work, the developer is swarmed with applications. But I still take the time to apply if I see a good opportunity, and occasionally I get hired for it. ENYO and Miracle Merchant: I asked if I could help playtest ENYO after I saw a screenshot the developer posted on Twitter for #screenshotsaturday. Turns out it didn’t have any music in it, and I asked if I could write something for it. He then brought me back for a later game called Miracle Merchant. Meteorfall: The developer of Miracle Merchant posted a video of my sound design for that game on Twitter. A few people liked what they heard and reached out to me because of that tweet, including the developer of Meteorfall. Treasure Adventure World: I met this developer, along with at least 5-6 more developers I work with, from attending events regularly in the local NYC game development scene. However, as I said at the start of the guide, this is just my experience. I can think of a number of people whose careers have evolved in ways very different from mine. Josie Brechner was putting out Creative Commons tracks on Free Music Archive when the publisher of Blossom Tales stumbled upon her music and got in touch with her about doing a full soundtrack. Darren Korb knew the developers of Supergiant Games since high school, and they worked together on Bastion, an indie game which blew up. Daniel Perry, Audio Director at Owlchemy Labs, met his team years ago at a game jam in Boston. They made a number of mobile games together until a VR game they worked on called Job Simulator blew up. Cole Verderber was spending a lot of time hanging around Powerup Audio's Twitch stream and getting to know the team face-to-face by meeting them at PAX. They listened to his work and eventually asked him to demo for them, after which they hired him.